Senior Tory MPs threw Theresa May an 11th hour lifeline today by backing an amendment endorsing her Brexit plan – as long as she can overhaul the Irish border backstop. Former ministers Grant Shapps and Nick Boles are among those who have signed up to the proposal, while Boris Johnson also hinted he might get on board. 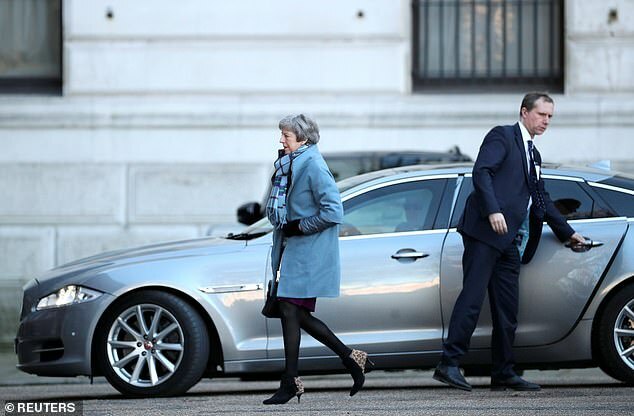 Mrs May seems to be pinning her hopes on the amendment tabled by 1922 committee chairman Sir Graham Brady, which would demand a rewriting of the controversial backstop. Sir Graham said his plan would give ‘enormous firepower’ to Mrs May in talks with the EU, but insisted any concessions must be ‘legally binding’. ‘I don’t think anybody is going to accept something which is just warm words,’ he told BBC Radio 4’s Today programme. 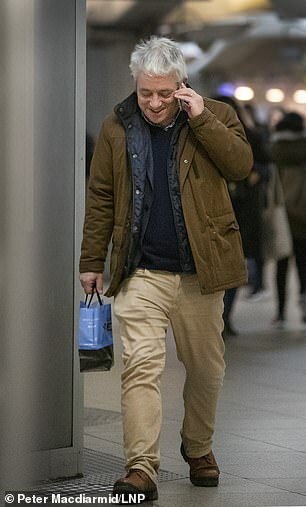 However, there are fears that Speaker John Bercow – who has so far shown little inclination to help the government – will kill off the plan by refusing to call it for a vote unless significant numbers of MPs signal support. So far just eight politicians have formally added their names – and although more have indicated they will sign, other Brexiteers voiced suspicion that the amendment will just kick the can further down the road. ‘It is well intentioned, but some people are not thinking it through,’ one former minister told MailOnline. ‘Many Tory Eurosceptics are in the same place as me, and are convinced it is meaningless. Three other amendments look highly likely to be selected by Mr Bercow after garnering scores of names – and all look on track to be approved by MPs. No10 has been pleading with MPs not to back a proposal tabled by Labour’s Yvette Cooper that would pave the way for a law to extend the Article 50 process. Another change put forward by ex-minister Caroline Spelman would try to rule out a no-deal Brexit – although the outcome would not be binding on the government. A separate move from Tory MP Dominic Grieve would stage a series of ‘indicative’ votes to work out what approach would gain a majority in the Commons. Sir Graham said his amendment was drawn up after meetings with ministers including Mrs May, and he believed the DUP would support it. Asked if it had Government backing he said: ‘I hope so… I don’t know so. The amendment was born out of a number of conversations I had with colleagues including members of the Government, including the Prime Minister. Mr Johnson said a time limit or unilateral exit could ‘defuse the booby trap’. But he also warned that meant rewriting the text of the Withdrawal Agreement – something the EU has so far been adamant cannot happen. Writing in the Daily Telegraph, Mr Johnson called on the PM publicly to confirm a ‘change of heart’ on the withdrawal deal. He said: ‘That backstop is dead, rejected by the biggest ever parliamentary majority; and that is why I hope and pray that I am right about the intentions of Number 10. 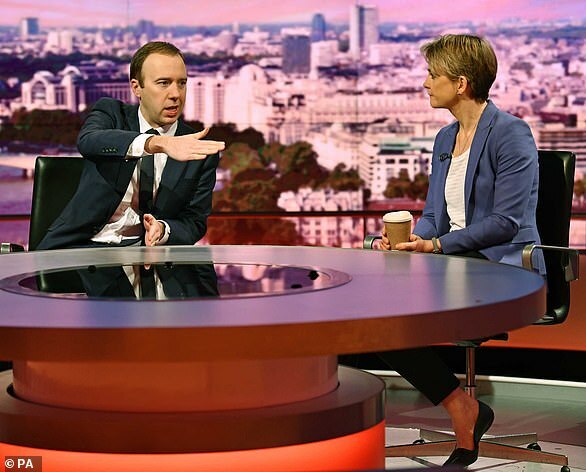 The plan being pushed by Labour’s Yvette Cooper and former Tory minister Nick Boles is designed to stop a damaging no deal Brexit, as it would postpone the March 29 leaving date by nine months if a deal is not secured by February 26. Labour has indicated it is ready to back the proposal – giving it a realistic chance of success – although Jeremy Corbyn has said no final decision will be taken until tomorrow when the amendment selection happens. 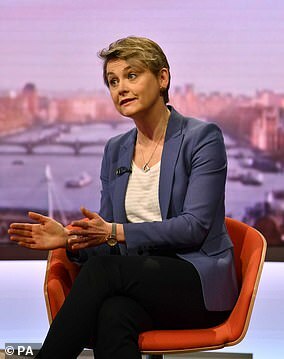 But appealing for MPs to shun the Cooper plan, a senior No10 source said: ‘Leaving aside the constitutional concerns around the Cooper Bill, it is clear from Yvette Cooper’s comments that backing her Bill means signing a blank cheque when it comes to delaying Brexit. ‘It could mean Brexit is delayed for nine months, a year, or more. It also opens the door to Brexit not happening at all.’ The warning came amid signs that Tory ministers who threatened to quit over a No Deal were stepping back from the brink. 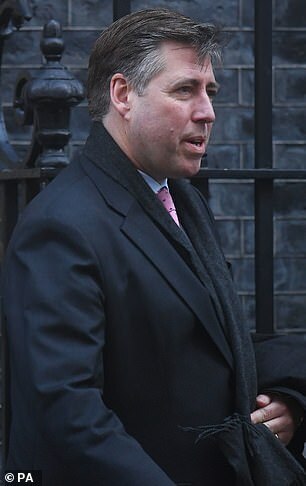 Tory former minister Nick Boles, a leading supporter of Ms Cooper’s plan, told Today there was a ‘great deal of support among ministers and, indeed, Cabinet ministers’ and they had been pressing for a free vote on the amendment. ‘This is the last chance for Parliament, this is probably the only opportunity that Parliament is going to have to intervene in this process, to take control,’ he said. The PM is seeking to see off the threat of a Tory rebellion, and the possibility of ministerial resignations, by considering whether to hold a ‘meaningful vote’ on Brexit within the next fortnight. A dozen pro-European ministers including Work and Pensions Secretary Amber Rudd and Justice Secretary David Gauke reportedly held a conference call in which they agreed such a move would help defer a potential rebellion. 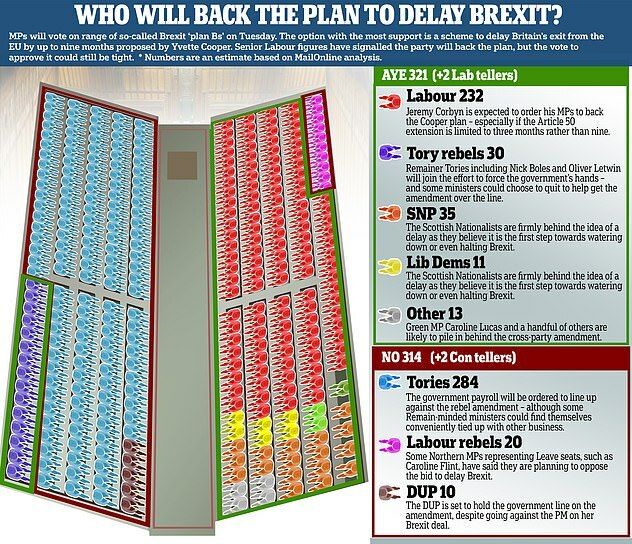 What is Tuesday’s Plan B vote and what will it mean? Because Theresa May’s Brexit deal was defeated, the law says she must tell Parliament what her Plan B is. This has to be done in a motion to the Commons, which will be voted on by MPs on Tuesday night. That motion can be re-written by MPs if they table amendments and win a vote in favour of them. Some amendments have already been tabled and MPs can keep producing them until Monday night. What does May’s plan say? It promises more cross-party working, renews commitments to protecting workers’ rights after Brexit and says the PM will ask Brussels for more concessions on the backstop. It it based on the current deal that was crushed by 230 votes last week. What do the main amendments say? Jeremy Corbyn’s amendment says Parliament should vote on ‘options’ including a renegotiation of the deal to get a permanent customs union and for a second referendum. A cross party amendment from Yvette Cooper and Nicky Morgan seeks to block no deal by giving time to a draft law that would require the Government to delay Brexit if a deal has not been agreed by February 26. It upturns normal convention by putting a backbench MP’s Bill ahead of Government plans. An amendment from Tory rebel Dominic Grieve seeks to set up weekly debates that would mean regular votes on what to do in the absence a deal. His amendments sets aside six named days for the debates – including as late as March 26. The Government also appears to be encouraging MPs to back amendment from two senior Tory MPs. One from Andrew Murrison would effectively set a time limit on the backstop of December 31, 2021. Another amendments tabled by Sir Graham Brady, chair of the powerful 1922 committee, would effectively eradicate the backstop and demand the EU and UK find other solutions. Some ministers hope that if these amendment receive strong support it will pile pressure on the EU to make concessions on the backstop – which Brexiteers fear the UK will be stuck in forever, and the DUP believes risks splitting the union. What would the vote do? Legally nothing – but if the Commons votes in favour of a clear way forward by a majority it will be a major political signal of what might happen. Is it a new ‘meaningful vote’ that can approve May’s deal? No. At some point, the PM will have to stage a repeat of last week’s vote to get explicit approval from MPs to go ahead with her deal if she wants it to survive. ‘If we mean it, if we really try, I have no doubt that the EU will give us the Freedom Clause we need. Chancellor Philip Hammond and Mrs May’s effective deputy David Lidington have urged Remainer ministers to keep their powder dry rather than joining the rebellion this week. Yesterday Mr Lidington argued this week’s vote was not the ‘final decision point’ and insisted MPs will have another ‘meaningful vote’ on Mrs May’s deal next month once she has been back to Brussels. The source said: ‘We don’t think there will be fireworks this week. I don’t think there will be mass resignations. The Cooper amendment has won the backing of nearly ten Tory MPs – all voted Remain in 2016 and several back a second referendum. Labour is also expected to whip its MPs to support it. Yesterday Ms Cooper told the Andrew Marr show that her Bill ‘gives Parliament the option to decide how long [the delay] should be’ and that it was ‘not about blocking Brexit’. Under her proposal, Mrs May would be forced to ask the EU for an extension to Article 50 if she fails to secure a deal.